It is an intuitive program that can help eBay users track a large number of auctions from a single screen, with the ability to bid bid just seconds before they close, to give you the best chance of winning at the lowest possible price. 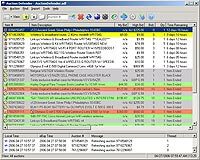 This new generation software is designed to use screen space as efficiently as possible, allowing for tracking hundreds of auctions at the same time, and completely eliminating the need for continued clicking and refreshing at the end of eBay auctions. Auction Defender saves you both time and money, it simply makes sense ! Auction Defender has a number of unique features beyond the capabilities of simple, even higher cost sniper only tools. Just try it free, and you will soon regard this intuitive software as your most valuable eBay tool. There are no hidden costs, or per auction fees, as with website bidding services. Your information is only shared with eBay, we both respect and protect your privacy. With a free trial, you have nothing to lose, try Auction Defender today ! Watch and bid on auctions from a single efficient screen interface. Easy bidding while you're away from your computer. Bid just seconds before the auction end (snipe), you will get that last bid in ! Alerts on any auction activity, such as high bid change, or when outbid. Easy program interface that can be setup and mastered in minutes. Add auctions with a single click using an integrated Internet Explorer or Firefox button ! Single-click import from the built-in internal browser as well ! Add auctions with drag/drop of auction links (or copy/paste) from any browser to the program. Import auctions directly from "My eBay" watch lists. Mass-import auctions directly from any eBay search results page ! Favorite searches can be saved for future importing. Bid Groups support: win only one, (or a few) items from a group of auctions. Conditional Bids: specify conditions to be met before a bid is placed. Multiple eBay accounts: you can specify the account to use for each item. Write personal notes for auctions you're interested in. Flag auctions with custom icons for easy recognition. Easy, sorting and custom views of the auction grid. Customizable colors, grid columns, sounds, alerts, views, etc. Automatic periodic eBay time synchronization for precise sniping. Automatic login to eBay as necessary. Automatically wakes up computer from sleep/suspend power saving modes as necessary to place bids. Optional automatic deletion of old closed auctions. Multi-threaded backend, completely independent bidding and refreshing. Ability to bid on multiple auctions, even at exactly the same time. Minimal network impact, even with hundreds of auctions loaded. Multiple auction files: ability to work with multiple sets of auctions. Seller / High bidder feedback information directly in program. Seller cost/proffit calculation, with automatic exact eBay fees. Item images available in program, no need to open a browser. Support for multiple item listings, and "Buy it Now" items. Custom view filters: you can view different groups/types of auctions. International support, including different currencies and date formats. Works with reserve price, dutch, fixed price and private auctions. Works with eBay Motors and Mature Audiences categories. Statistics about refreshing/bidding times to fine-tune sniping. Automatic fast program updates to keep up with eBay changes. Periodic software improvements, we listen to our users' suggestions ! No bid fees, no monthly subscription fees. Use on up to 3 computers with a single license ! Free email technical support for registered users. No spyware: we respect and protect your privacy. User ID information is only shared with eBay. Free/Limited mode - the prorgam is free to use for up to two snipes per week, and 100 loaded auctions. Licensed/Full mode - the program will have all features unlocked, without any limits on auctions/snipes/alerts. Improved alerts system with email/SMS support, as well as per auction customizations.